After a long period of waiting, a computer couple friend of mine have finally been able to have a baby. As part of the baby items I have made is this fleece blanket. The Dad is a pilot. I had some airplane flannel leftover from the back of the first quilt, so I used it as the binding. I used two freebie embroidery designs to embellish a corner. 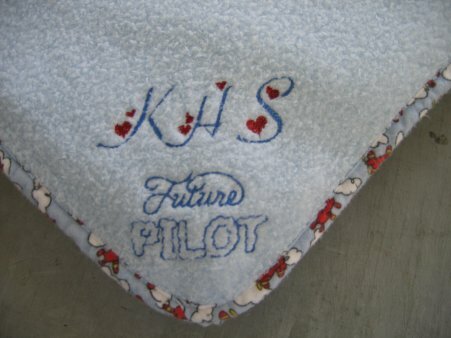 The initials are Heart Alpha from Thread Stop (sadly, it appears as though the alphabet is no longer available .. but ask The Thread Stop anyway ... they just might humor you); the "Future Pilot" came from Embroidery Bayou. Go to the free design section, then Children.